A purpose of the research was to develop a method for the preparation of novel organo-mineral fertilizers with the use of brown coal and biochars as organic additives. Brown coal was blended simultaneously together with inorganic materials used for the process of urea superphosphate production in a laboratory scale using a pan granulator and in larger scale using a rapid mixer granulator. Biochars were used for the coating purposes of the urea superphosphate granules on a laboratory scale using a pan granulator. Moreover, the aim was to measure and evaluate the physico-chemical properties of organic materials and the obtained organo-mineral fertilizer products and to study the effects of these products on the selected yield components of spring wheat such as grain yield per plant, spike number per plant, and plant height, in pot trials. Results showed that brown coal and biochars can be used as raw materials for production of fertilizer products. Brown coal contained about 50% of total humic acids while biochar contained nearly 6% of total humic-like substances. Brown coal based compound fertilizer granules produced in the large scale were characterized by particle hardness from 15.80 to 23.3 N while those produced in the laboratory scale were classified as “soft” (particle hardness below 2.3 N). The application of brown coal based fertilizers and two studied biochar coated fertilizers had a positive impact on the grain yield per plant of spring wheat. The research was undertaken to develop a production method of a novel organo-mineral fertilizer based on bio-feedstocks. Brown coal and biochars were used as fertilizer components to improve the fertilizer use efficiency and soil properties in order to stimulate the plant growth. The method for the incorporation of brown coal into the urea superphosphate formulation was done for the first time. Three different biochars were used for coating purposes of urea superphosphate granules. It was found that water as a binder together with biochar can act well as coating materials but additional study is necessary to improve abrasion resistance of the coated fertilizer granules. The brown coal and biochar based fertilizers had a positive influence on a spring wheat yield. Nowadays, there is clear evidence of a decline in the organic carbon contents in many soils as a consequence of the intensification of agriculture over past years [1, 2]. Organic carbon is a major component of soil organic matter that plays an important role in the formation of stable aggregates of the soil structure . Moreover, soil organic matter acts as a storehouse for nutrients, is a source of soil fertility, improves infiltration rates, increases the storage capacity for water, serves as a buffer against changes in soil reaction (pH), and acts as an energy source for soil microorganisms . Thus, improving nutrient use efficiency (NUE) and reversing the loss of soil organic matter are major global challenges. One possibility to improve the soil properties can be to use soil improvers, organic and organo-mineral fertilizers. Brown coal that is characterized by very low heating value can be used as a component of organo-mineral fertilizers. It contains organic matter in a complex, porous, three-dimensional network, which varies depending on deposit location. Humic acids are very important components of brown coal and can account 10–80% of its organic matter . They contain many functional chemical groups that help to physically modify and improve the chemical properties of the soil and biologically stimulate plant growth . Thus, humic acid products mainly as plant growth enhancers and as ingredients of fertilizer products are widely distributed throughout the world. Brown coal is an alternative material with properties that make it appealing for use as a N fertilizer carrier. The study found  that its incorporation into soil slightly reduced ammonium availability in one soil. Brown coal—urea blended fertilizers show potential for more efficient use of N in the long term and has environmental benefits in retaining more N in the soil . Biochar is the residue of pyrolysis and is often used to pre-dried biomass feedstock or is sold as charcoal briquettes. A novel approach is to explore the value of this by-product for coating purposes of the mineral fertilizers. According to Lehmann  two aspects of biochar make it valuable for the purpose of adding this material to soil: (i) high stability against decay and (ii) its superior ability to retain nutrients as compared to other forms of soil organic matter. Thus, three environmental benefits arise from these properties: (i) mitigation of climate change, (ii) improvement of soils, and (iii) reduction of environmental pollution . Biochar created from waste biomass (e.i., waste wood or plant material after extraction) by pyrolysis technique [8, 9] can contain certain amounts of extractable humic-like and fulvic-like substances . 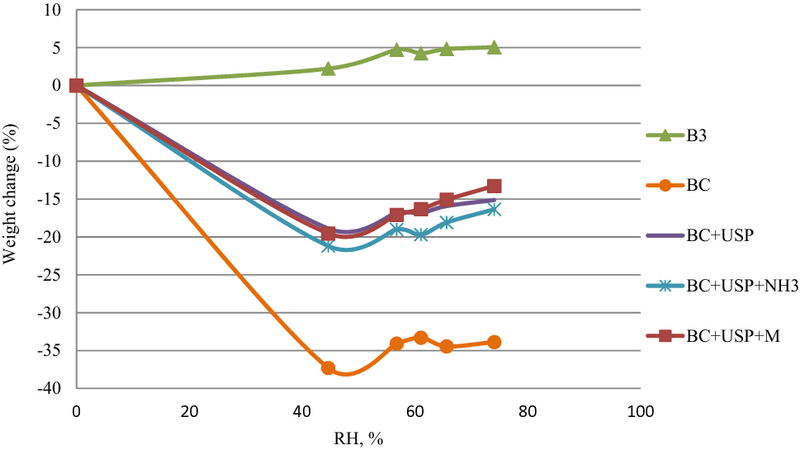 A number of studies [5, 11, 12] show that biochars can reduce nitrate and ammonium leaching from applied nitrogen fertilizers, but the effectiveness depends on the chemical characteristics of biochars and their rate of application. In agriculture, over-fertilization results in a decrease of fertilizer use efficiency and leads to environmental and ecological problems. The use of controlled release or slow release fertilizers may increase nutrient use efficiency. Controlled release fertilizers (CRFs) could release nutrients gradually, which try to coincide with the nutrient demand during crop growth. Slow release fertilizers (SRFs) are characterized by the release of the nutrients at a slower rate than is usual but the rate, pattern, and duration of release are not well controlled . Previous studies [14, 15] indicated that biochar can be used as the component of coating materials for fertilizers and its addition increases the degradability of polymer film, which is attributed to the fact that biochar could adsorb soil microorganisms. The present work attempts to develop a method for the preparation of novel organo-mineral fertilizers with the use of brown coal and biochars as organic additives. Brown coal together with inorganic raw materials, which are used in urea superphosphate production, were granulated using two granulation methods: pan granulation and high shear granulation. Moreover, the coating process of urea superphosphate granules using three types of biochars was studied. The physico-chemical properties of the obtained organo-mineral fertilizers were investigated. The effect of brown coal based fertilizers and biochar coated fertilizers on spring wheat in pot experiments was evaluated. Phosphorite (Djebel Onk, Algeria) bought from the Chemical Plant “Siarkopol” TARNOBRZEG Sp. z o.o. (Poland) was used. Table 1 shows the chemical composition of phosphorite. The phosphate flour was also characterized according to its particle size distribution (Table 2). Technical sulfuric acid (conc. 95%), gaseous ammonia (NH3—min 99.8 wt%), granular urea (N—min 46 wt%, biurea—max 1.2 wt%, moisture—max 0.3 wt%) were from Grupa Azoty Puławy SA (Poland). Caustic magnesite was from MAGNEZYTY “GROCHÓW” S.A. (Inc.) company (Poland). Table 3 shows the physico-chemical properties of magnesite. Dolomite from dolomite mining company (Górnicze Zakłady Dolomitowe SA), “Siewierz Mine” (Poland) was used. Table 4 shows the chemical composition of dolomite. Run-of-mine brown coal (BC) from Brown Coal Mine “Sieniawa” (Poland) was used. The coal had a moisture content of 47.7% (wet basis) and was milled to < 2 mm particle size. Biochars produced by pyrolysis technique from different feedstocks and under different production conditions were used. Biochar 1 from the Pyreg (Germany) plant was produced from a medicinal plant material after extraction, biochar 2 from the University of Limerick (Ireland) plant was produced from energy-crop willow, and biochar 3 from the Fluid SA (Poland) plant was produced from wood chips. Urea superphosphate (USP) fertilizer was produced in the pilot plant at the New Chemical Syntheses Institute according to the EP application . Analysis of nutrient contents in urea superphosphate showed that it contained 21% of N, 10% of P2O5, 15.9% of CaO, and 7.9% of S.
A moisture content was determined by a gravimetric method at a temperature of 105 °C for 4 h. The pH value was measured in 1:10 sample:water ratio after 0.5 h shaking. After this, samples were allowed to stand for 30 min and then pH value  and electrical conductivity (EC) was measured using a multifunction computer meter (Elmetron CX 731, Poland) . Humic acid contents were determined by a volumetric method with titration of extracts according to the international standard . Phosphorus (P2O5) and potassium (K2O) contents were determined in water and acid solutions using a segmented flow analyser (Seal Analytical, Germany). Total contents of these nutrients were determined in ashes of brown coal and biochars after digestion with HNO3 and HCl (3:1). Metal contents were determined by ICP-OES (Varian 720-ES, Australia) after total digestion (HNO3/HCl) in a microwave (CEM Corporation Mars, USA). The carbon (C), hydrogen (H), and nitrogen (N) contents in samples were determined by combustion analysis using a Perkin Elmer 2400 analyzer. Loss on ignition (LOI) was determined at temperatures of 105, 400, and 1000 °C in a muffle furnace. Urea was hand-mixed with sulfuric acid and water. The mixture was heated to about 80 °C. Bulk materials such as brown coal and phosphorite flour were mixed in a cube mixer (ERWEKA GmbH, Germany). The urea-sulfuric acid mixture and water were used as binders in a granulation process. For a batch, 1890 g of wet coal (with moisture of 47.7%), 336 g of phosphorite, 457 g of urea (46% N), 217 g of technical sulfuric acid (98%) and 28.2 g of water were used plus additional water in the amount of 54 g at the end of the granulation was added. The raw material consumption was as follows: 50 wt% of brown coal (calculated to dry matter), 16.8 wt% of phosphorite, 22.9 wt% of urea, 10.9 wt% of technical sulfuric acid (calculated as 100%) and the water consumption was 4.1 wt%. The granulation was carried out in a pan granulator (ERWEKA GmbH, Germany) with a diameter of 400 mm. The binder was sprayed using a hand sprayer (Kwazar Corporation Sp. z o.o., Poland) of the volume of 1 dm3 on the bulk materials while the pan granulator was rotating. Granulation occurred in less than 15 min. The granules were air dried for 5 days and dried in a laboratory dryer at 105 °C for 3 h.
For granulation on a large scale, a rapid mixer granulator (20 dm3) (IdeaPro MDL-04, Poland) was used. This type of the granulator allows intensive mixing and simultaneous granulation of various raw materials. Bulk materials such as brown coal and phosphorite flour were preliminary mixed in the mixer granulator (turbine speed—250 rpm, vessel speed—120 rpm). Urea, sulfuric acid, and water were mixed in a reactor equipped with a heating jacket and then were heated to about 80 °C. The mixture of urea-sulfuric acid was added to bulk materials while the mixer granulator was rotating. In order to increase the pH value of the final fertilizer products the following additives were used: gaseous ammonia, dolomite, and caustic magnesite. Coating of urea superphosphate granules using three different biochar materials and water as the binding agent was carried out in the pan granulator (ERWEKA GmbH, Germany). While the granules were rotating in the pan granulator, biochar was manually added and water was sprayed using a hand sprayer (Kwazar Corporation Sp. z o.o., Poland). The samples were called: B1 coated USP (B1—biochar produced from a medicinal plant material after extraction), B2 coated USP (B2—biochar produced from energy-crop willow), B3 coated USP (B3—biochar produced from wood chips). Biochars constituted 10% of the total granules mass. Particle hardness of fertilizers (n = 20) was determined using ERWEKA TBH 200 apparatus. Results of particle hardness was statistically calculated as a mean value of the test results excluding outliers using Dixon’s Q-test. Abrasion resistance of biochar coated USP fertilizer granules were carried out using ERWEKA TA/TAR apparatus (speed = 30 rpm; time = 15 min). After the above test, granules were hand-shaken on the sieve and weighted. Results are expressed as a percentage ratio of granules remaining on the sieve with the mesh size of 1.00 mm to the initial weight of the sample. Sieve analysis was carried out according to the standard method  using a vibratory sieve shaker (Retch AS 200, Germany). Particle size distribution of the products was measured by a sieve analysis on vibrating screens (2.0, 2.5, 3.15, 4.0, 5.0 mm). The nutrient contents were determined according to methods dedicated for the fertilizer quality analysis . Hygroscopicity evaluation of brown coal, biochar (B3) and selected fertilizer samples was carried out using desiccators with sulfuric acid solutions of the appropriate concentrations. Sulfuric acid concentrations were as follows: 6.25, 5.25, 4.91, 4.54, and 3.81 mol dm3 that provide relative humidity of 44.64, 56.77, 61.06, 65.62, and 74.06%, respectively. The samples were stored in air atmosphere with different relative humidity for 7 days. The study uses the dependence of relative humidity on the H2SO4 concentration and assumes that the easiest way to determine hygroscopicity is to measure the mass increases of samples in the atmosphere under different relative humidity. The measurement of hygroscopicity of raw materials and fertilizer samples allows to determine the tendency of the individual sample to absorb water from the environment depending on the air relative humidity. In 2018, a greenhouse experiment was conducted to determine the effects of brown coal based fertilizers and biochar coated fertilisers compared to control, commercial fertilizer, and urea superphosphate (USP) on grain yield per plant, spike number per plant, and plant height of spring wheat cv. Varius. Wheat was grown in pots containing 7 kg of soil. Fertilizers were applied at a sowing by mixing fertilizer granules with soil. Fertilizer treatments were as follows: T0—control: 2.36 g MAP (NP 10–55), 3.7 g K2SO4, 10.4 g (NH4)2SO4; T1—11.48 g urea superphosphate (NP 21–9), 0.54 g KH2PO4, 3.35 g K2SO4; T2—5.88 g commercial fertilizer NPK(S) 6-12-34-(10), 1.09 g MAP, 9.33 g (NH4)SO4; T3—25.06 g brown coal based fertilizer with ammonia (BC + USP + NH3), 0.65 g KH2PO4, 3.29 g K2SO4; T4—29.06 g brown coal based fertilizer with magnesite (BC + USP + M), 0.49 g KH2PO4, 3.39 g K2SO4; T5—13.50 g medicinal plant biomass biochar coated urea superphosphate, 0.54 g KH2PO4, 3.35 g K2SO4; T6—13.50 g energy-crop willow biochar coated urea superphosphate, 0.54 g KH2PO4, 3.35 g K2SO4; and T7—13.50 g wood chips biochar coated urea superphosphate, 0.54 g KH2PO4, 3.35 g K2SO4. Each treatment has received the same dose of NPK (2.4 g N, 1.3 g P2O5, 2 g K2O per a pot). Plants were watered to 60% field capacity. The plant height was measured at a booting stage of wheat development (Feekes scale 10) . The physico-chemical properties of brown coal and biochars are presented in Table 5. An understanding of brown coal pH is important given its likely influence on properties of the final brown coal based fertilizer products. The brown coal sample (Sieniawa mine, Poland) was acidic. The brown coal distillate (coal mine in Eshan county of Yunnan province, China) was also characterized by the acidic pH value (pH 2–3) . The study conducted by Hoffmann and Huculak-Mączka  showed that pH value of the Polish brown coals was closed to neutral. The brown coal electrical conductivity (EC) was 1.362 dS m−1 and was not very high as compared to water or soil leachate EC values. For example, the EC values of Polish waters under influence of natural salinity usually did not exceed 15 dS m−1 . Moreover, research conducted in Poland showed that the EC of soil saturation extract values from soda industrial area varied between 0.9–15.4 and 1.0–87.2 dS m−1 for surface and subsurface layer, respectively . The moisture content of brown coals is the important parameter for some applications e.g. for their use as fertilizer components. The moisture of wet brown coal was nearly 50% and was similar to the moisture of brown coal sample from Loy Yang, Australia . According to study , the moisture of Greek, Polish and Australian lignites was 50%, 55%, and 60.5%, respectively. Loss on ignition (LOI) is one of the most widely used methods for measuring organic matter content in soils . The mass loss can be due to the loss of moisture, carbon, sulfur, and so forth, from the decomposition or combustion of the residue . The LOI value of brown coal was lower as compared to LOI values of the studied biochars. It is known that the coal-substances originated primarily from plants through a series of evolutionary changes. The plant matter is transformed sequentially into humic acid, peat, lignite (brown coal), subbituminous coal, bituminous coal, and anthracite. During those transformations, the carbon content increases while the oxygen content decreases. Thus, the precise chemical composition of coal substances is unknown because it may be derived from a variety of sources by numerous combinations of physico-chemical processes which lead to variations of mixtures of carbon-containing compounds . Coals consist of broad range of substances. Owning their origin to the partial decomposition and chemical conversion, brown coal contains organic matter in a complex, porous, three-dimentional network which varies depending on deposit from one location to another. Humic substances are defined as a soluble (extractable) fraction of organic matter and they are the main components of the organic portion of brown coal . They can be obtained by alkaline extraction of brown coals or leonardites. The total humic acids can be obtain by extraction with the alkaline pyrophosphate solution and free humic acids can be obtained by extraction with sodium hydroxide and the methods were used in our research. Brown coal sample was characterized by the relatively high free humic acid values (> 50%). Research showed that humic acids occur naturally in lignite and can account from 10 to 80% depending on the maturity level of the lignite organic matter [31, 32]. For example, the content of humic acids in Greek leonardites was below 20% and seldom below 30%. While, American leonardites were characterized by the high humic acid contents (> 80%) . Thus, the studied Polish brown coal can be the valuable raw material for preparing humate-based fertilizer products. Our results agree with the previous study . Researchers  who examined European coals found that they are characterized by low contents of heavy metals. Cadmium and lead contents in brown coal were below the limits of detection. Organic elemental analysis showed that the studied brown coal was characterized by carbon content of 53.46 wt%, hydrogen content of 4.42 wt%, nitrogen content of 0.76 wt%, and the H/C molar ratio of 0.99. The value for carbon content is slightly below the range reported in literature and the values for the contents of hydrogen and nitrogen are within the range reported in literature for the European brown coals. For example, Janos et al. found that carbon content was in the range of 55.43–68.03%, hydrogen content was in the range of 3.84–5.79% and nitrogen content was in the range 0.71–1.86%. Biochars as organic materials can be used as components of mineral and organic fertilizers or soil amendments [32, 33, 34]. The studied biochars were alkaline (pH value in the range of 7.4 to 10.3). According to literature , most biochars are alkaline, however, biochar pH values between 3.1 and 12.0 have been also reported [7, 36, 37]. Feedstock and pyrolysis temperatures are two of the most important factors affecting biochar pH values. For example, biochars derived from animal biomass or manures tend to have higher pH than biochars pyrolysed from plant species [38, 39, 40]. As most biochars (especially high-temperature and animal-biomass derived ones) are alkaline in nature . Biochars produced under high temperature (> 400 °C) are likely to have greater pH value than the low temperature (< 400 °C) biochars from the same feedstocks . The studied biochar EC values were within the ranges reported in literature . The biochar EC is dependent on the feedstock and the pyrolysis temperature. Biochars produced at higher pyrolysis temperatures generally have higher EC values and this effect has been attributed the increasing concentration of residues or ash caused by the loss of volatile material during [42, 43]. Differences in the EC of biochars produced from different feedstocks are attributed to differences in their ash contents . Wood and paper waste biochars generally have lower EC values than manure biochars . Alburquerque et al. found that the electrical conductivity (EC) value differed greatly among samples (1500 µS cm−1 for olive tree pruning biochar and 2800 µS cm−1for wheat straw biochar). The LOI-550 representing the organic matter fractions of biochars . Our results were similar to other studied biochar LOI values  and ranged from 87.28 to 95.99 wt%. Soudek et al. examined different biochars and found that the Cd content was in the range from 0.14 (rice husk biochar) to 0.26 mg kg−1 (ash tree biochar) and the Pb content in the range from 0.86 (ash tree biochar) to 3.7 mg kg−1 (beech tree biochar). Our results showed that the studied biochars were characterized by Pb content below the detection limit of 4 mg kg−1 and Cd content below 1 mg kg−1, except for the medical plant biochar sample that was characterized by Cd content of 1.59 mg kg−1. Pb and Cd are elements dominantly extracted from inorganic component of lignite . Moreover, the authors  pointed out that the elements are differently distributed and can be divided into groups based on the difference of their extractability in the particular phase of the sequential extraction of the coal. The average concentration of Pb was 14.91 mg kg−1 and the concentration of Cd was 0.10 mg kg−1 in the 5th phase of the sequential extraction of the eight milled lignite samples . The examined biochars were characterized by low contents of humic substances (up to 6.89 wt% of total humic acids). According to research conducted by Zhang et al. the wood biochar sample was found to have the most humification materials (fulvic acid-like and humic acid-like materials) in the water-extractable fraction, which was 3–10 times higher than that in the rice husk biochar and rice husk ash while humified materials were not detected in the bamboo biochar sample. Organic elemental analysis showed that biochars contained total carbon in the range of 63.5 to 85.80 wt%. For example, pine biochar was characterized by the total C content of 79.34% and corn cob biochar by the total C content of 78.58%. Hydrogen contents in the studied biochars ranged from 0.95 to 1.99% and nitrogen contents from 0.57 to 1.80%. For example, the total N content in pine biochar was 0.02% and in corn cob biochar was 0.68% and the total H content in the mentioned above biochars was 1.22 and 1.91%, respectively . Moreover, the H/C molar ratio (ranged from 0.18 to 0.28) in the studied biochars was similar to results (0.18 for pine biochar and 0.28 for corn cob biochar) obtained in other study . Biochar ashes were characterized by high amounts of total P2O5 contents (from 6.07 to 17.63 wt%) and total K2O contents (from 8.27 to 25.45 wt%). In the other research study , it was found that wood ash contained total P2O5 of 3.89% and total K2O of 9.5%. Table 6 shows the moisture content and the pH value of the brown coal based fertilizer product produced in the pan granulator on laboratory scale. The moisture content of the fertilizer product sample was 30.2%. The pH value of samples was acidic (2.4–3.7%). The fertilizer product was too acidic to use it in further pot trials because of the future soil acidification and the negative impact on a plant growth development. According to the study, more research should be done to increase the pH value of the final fertilizer product, e.i. study on the addition of alkaline raw materials. Particle hardness measured as Newtons (N) refers to the amount of force that particles can withstand before rupturing . This parameter was determined in the fertilizer product after drying at 105 °C for 3 h. The brown coal based fertilizer granules were characterized by very low particle hardness. All of the granules (100%) were classified as weak granules. For the average size of granules of 4.26 mm, the average hardness was 2.3 N. The granules were classified as “soft” because they very easy crushed between the thumb and forefinger . The research on binder agents and the addition of other raw materials should be studied in order to increase the particle hardness of the final fertilizer product. Rose et al. conducted research on brown coal-urea blended fertilizer (urea to wet coal ratio of 1:6) that was granulated and dried in the pilot scale superheated steam drum dryer. The granule crush strength was weak (2.2–2.9 N) and our results are in agreement with the study . Because of the unsatisfactory mechanical and physical properties of fertilizer granules obtained in the laboratory scale using the pan granulation, it was decided to select the method of high shear granulation in the larger scale. The raw material consumption at the trial 1 in large scale was similar to the trial conducted in the laboratory scale (Table 7). After conducting the trial 1 in the large scale, it was stated that granules obtained in the high shear granulation process were characterized by the better mechanical and physical properties and the granules size as compared to the pan granulation. Thus, it was decided to choose the mentioned method of granulation to study the effect of the additives on the fertilizer product quality. Moreover, during the production of fertilizer some gases can be emitted because of the reaction processes between the used raw materials (e.g. urea, phosphorite, sulfuric acid and brown coal). The mineral materials were similar to those used in urea superphosphate production. The following example reactions should be taken into the account: reaction of sulfuric acid with phosphorite, reaction of urea with sulfuric acid, reaction of mixture urea-sulfuric acid with phosphorite and brown coal, reaction between acids and ammonia etc. Phosphate rock usually contains between 3% and 4.5% of fluoride by weight . During the acidulation of phosphate rock, released hydrogen fluoride is usually converted into fluosilicic acid by silica in the rock, most of which is retained in the product, but about 25% is released in production process of the phosphate fertilizers. Wet scrubbers are required for production of phosphate fertilizers. In addition, fluoride emission continues during the curing process . Moreover, greenhouse gas emissions during fertilizer production occur . Similarly, there can be small amounts of fertilizers released during maintenance. Thus, pollution prevention and control is needed during the fertilizer manufacture. Although, dust was not observed during the pan granulation, the rapid mixer granulator (at which a chemical reaction is carried out simultaneously) equipped with a cover is the most suitable for the granulation purposes of the studied raw materials in order to prevent possible dust and harmful emissions to workers. At the conducted trials, the brown coal (dry mass) constituted from 45.5 to 50 wt% of total raw material consumption (Table 7). Water present in brown coal (wet brown coal moisture of about 50%) was the additional amount of water in the production process of the organo-mineral fertilizer. At the end of granulation process, some additional amount of water was added. Table 7 shows the raw material consumption at particular trials. 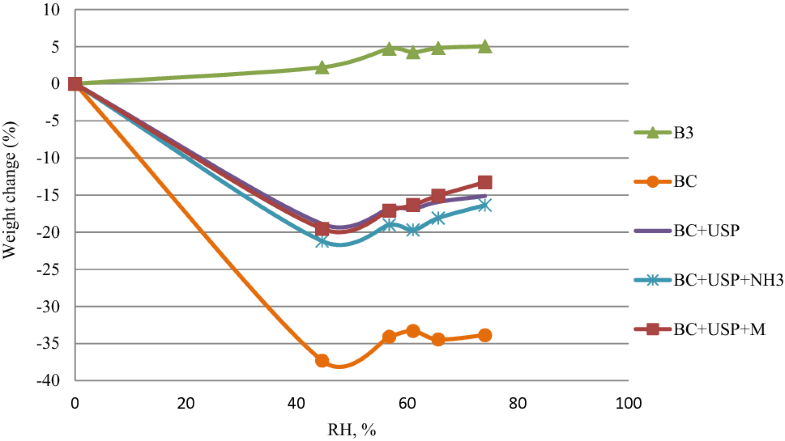 In order to determine mechanical and physical properties of the obtained fertilizer products, particle hardness and percentage of weak granules were determined (Table 8). Particle hardness of granules varied from 15.8 to 23.3 and after excluding weak granules (below 10 N) varied from 19.6 to 24.9 N. For handling purposes of fertilizers, particles hardness should be at least 13.73 N, and of 22.56 N or greater is highly desirable . Our results showed that particle hardness of granules was satisfactory. Figure 1 shows the particle size distribution of the obtained fertilizer products. In trial 1, the largest mass fraction was found in the particle size fraction > 6.3 mm (43.69%). Assuming that particles 2–5 mm are suitable for fertilizer application a product of output of approximately 47% was achieved. In trial 2, the largest mass fraction was found in the particle size fraction 1–2 mm (25.55%). The particles 2–5 mm made around 49% of the total mass. In trial 3, the largest mass fraction was found in the particle size fraction 1–2 mm (38.19%). The particles 2–5 mm made around 15% of the total mass. In trial 4, the largest mass fraction was found in the particle size fraction 1–2 mm (69.07%). The particles 2–5 mm made around 12% of the total mass. In the trials, the fractions < 1 mm made from 2.63% (Trial 1) to 33.01% (Trial 3) of the total mass and would be recharged into a mixer to the new batch. The oversized grains > 6.3 mm made from 4.7% (Trial 4) to 43.69% (Trial 1) of the total mass and would possibly be crushed and added to the product. Photographs of granules produced in the rapid mixer granulator are shown in Fig. 2. The products were spherical granules with smaller coarse surface particles attached. The chemical properties of the obtained brown coal based fertilizer granules were evaluated (Table 9). The moisture content of granules varied from 25.7 to 29%. The pH values of granules from trials 1 and 2 was acidic and amounted 2.6 and 3.3, respectively. The pH values of granules from trials 3 and 4 were higher and amounted 5.4 and 6.2, respectively. The addition of dolomite, gaseous ammonia and caustic magnesite increased the pH of the final products. Only granules from trials 3 and 4 were used for further pot trials because of the most appropriate pH value for soil and plants. Brown coal based fertilizers contained from 8.26 to 9.85% of total nitrogen, from 3.67 to 4.39 of total phosphorus (P2O5), from 2.86 to 3.72% of neutral ammonium citrate soluble phosphorus (P2O5), and from 0.69 to 2.60% of water soluble phosphorus (P2O5). The plant available phosphorus in granules constituted from 62 (trial 2) to 84.7% (trial 1) of total phosphorus and water soluble phosphorus constituted from 18.2 (trial 4) to 59.2% (trial 1) of total phosphorus present in fertilizer granules. Dolomite (trial 2) and caustic magnesite (trial 4) as components of fertilizer formulations were sources of Mg and Ca. Granules from the trial 2, contained 1.18% of Mg and 8.37% of Ca. Granules from the trial 4 contained 1.63% of Mg and 5.37% of Ca. Loss on ignition (LOI) of fertilizer granules at 105 °C varied from 28.7 to 31.5%, at 400 °C varied from 64.55 to 74.53%, and at 1000 °C varied from 73.98 to 82.61%. LOI is a common and widely used method to estimate the organic and carbonate content of sediments. In a first reaction, organic matter is oxidized at 500–550 °C to carbon dioxide and ash. In a second reaction, carbon dioxide is evolved from carbonate at 900–1000 °C, leaving oxide. The weight loss during the reactions is closely correlated to the organic matter and carbonate content . Hygroscopicity is the ability of a material to absorb or adsorb moisture from surrounding environment . This property of solid raw materials and the final solid fertilizer products is often evaluated due to the fact that the up-taken moisture can impact physical and chemical stability of the fertilizer products. Figure 3 presents the hygroscopicity measurements of biochar, brown coal, and brown coal based fertilizers. It was found that biochar sample (B3), stored under the relative humidity of 56–74%, absorbed water in the amount of 5% by mass. Biochars are porous materials and their pore structure has the effects on the water absorption and water retention properties . Gray et al. stated that water uptake by biochars is dependent on both feedstock, which controls residual macroporosity and production temperature, which controls hydrophobicity and pyrogenic nanopore formation. Brown coal, stored under the relative humidity of 74% for 7 days, lose water in the amount of about 34% by mass. Brown coal based fertilizers, stored under the relative humidity of 74% for 7 days, lose water in the amounts of 13–16% by mass. It was found that brown coal and brown coal based fertilizers underwent a natural drying process. According to other research, the affinity of pure carbon for water is low due to the unusually weak non-specific interactions between the non-polar surface and the highly polar character of this adsorbate [60, 61]. 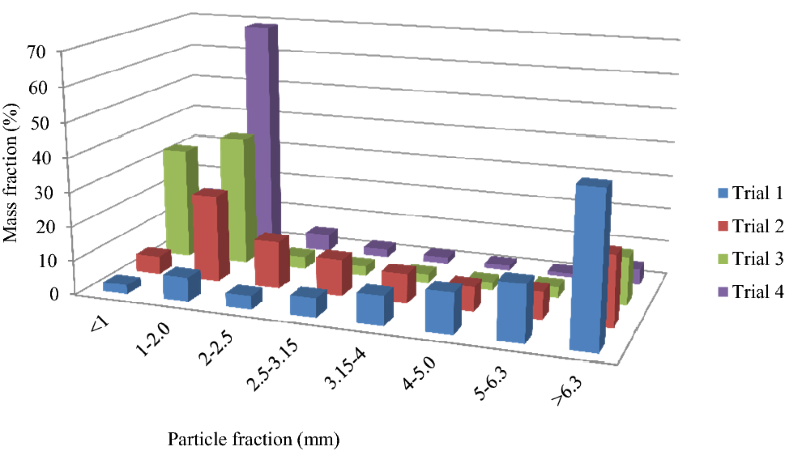 Table 10 shows the physical properties of USP and biochar coated USP fertilizer granules. Average particle hardness of biochar coated USP was lower (from 41.65 to 49.50) as compared to USP granules before coating (61.90 N). 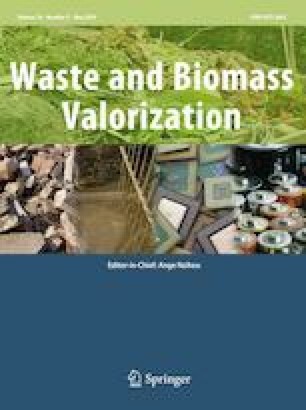 It was found that the type of biochar used for coating process had the influence on abrasion resistance of granules which varied from 2.5 to 7.8%. Figure 4 shows urea superphosphate and biochar coated fertilizer granules photographs. The coating of USP granules with biochar and water as the binder worked very well. Binders are responsible for a good adhesion of the coating to the substrate. Chen et al. used biochar waterborne copolymer of polyvinyl alcohol and polyvinylpyrrolidone as coating materials for urea. The above-mentioned study has showed the potential of biochar-based copolymer to improve the effectiveness of fertilizers. Moreover, researchers  stated that biochar decreased water absorbency of copolymer with an increased degradability, and contributed to improving the slow release property of coated urea. Chen et al. found that the rice biochar-based copolymer coated urea showed excellent slow-release performance of 65% nutrient leaching at the end of leaching test. Table 11 shows the yield, spike number and plant height of spring wheat cv. Varius. According to the conducted statistical analysis, the highest grain yield per plant was stated when wood chips biochar coated USP fertilizer (T7) was applied as compared to commercial fertilizer (T2) and medicinal plant biomass biochar coated USP fertilizer (T5). There were no significant influence of the studied fertilizer type on spike number per plant and plant height measured at the booting stage of wheat development. Results from this study showed that spring wheat responded positively to soil application of the brown coal based fertilizers and biochar coated fertilizers. Similar results were found by Ali et al. , who studied the effect of biochar, farmyard manure and nitrogen (organic and inorganic soil amendments) on growth and quality of spring wheat and determined that the biochar treatments could significantly improve wheat leaf, stem, straw and grain N and protein content. Researchers  have recommended biochar in combination with farmyard manure and mineral N in cereal–cereal cropping pattern in Pakistan to preserve soil, prevent soil degradation, and improve soil and crop quality. Reibe et al. found that yield, yield components and quality were mainly influenced by nitrogen fertilizer. The application of maize hydro-char could have negative effects on yield and yield components of spring wheat while hydro-char treated with digestate had no negative effects on yield of spring wheat. Alburquerque et al. found that the addition of biochar alone had the positive effect on some growth parameters but clearly lower when compared to the use of the mineral fertilization. Moreover, they stated the significant biochar × mineral fertilization interaction since the highest grain production was obtained when biochars were combined with the complete mineral fertilization, demonstrating the beneficial effect of biochar on wheat yield. According to the study biochar had much influence on soil properties, which can explain its effects on plant growth and grain production. Studied biochars  caused significant increases in soil pH, electrical conductivity, and resin-extractable phosphate. However, the application of biochar decreased resin-extractable ammonium and nitrate. The most relevant effect on plant nutrition was a decrease in N and especially in Mn plant uptake, which can limit crop performance in the long term. Therefore, the nutrient–biochar interactions should receive special attention. Biochar addition can enhance wheat yield with the environmental benefits of global warming mitigation, contributing to a more sustainable agriculture . In addition, biochar itself does not contain enough nutrients for crop growth. Asai et al. found that grain yield decreased when applying only biochar due to the insufficient supply of nitrogen. Thus, application of biochar with certain fertilizers (for example urea) or the use as a fertilizer component renders biochar materials more suitable for stimulating plant growth and heavy metal adsorption. In summary, brown coal and biochar can be used as raw materials for fertilizer production. Brown coal contained about 50% of total humic acids while biochar contained nearly 6% of total humic-like substances. Brown coal based fertilizer produced in laboratory scale using a pan granulator were classified as ‘soft’. Additional studies should be conducted to select a special binder and appropriate raw material ratios to increase the particle hardness. The scale up of the granulation process and the use the high shear granulation had the positive influence on the final product quality. Brown coal based fertilizer granules produced in large scale using the rapid mixer granulator were characterized by promising hardness and particle size distribution. The formed granules were of an appropriate size and sufficiently strong for agricultural use. Biochar can be used for the coating purposes of urea superphosphate fertilizer but additional studies are necessary to select the special binding agent in order to reduce abrasion resistance of granules. Results from pot experiments in greenhouse showed that spring wheat responded positively to soil application of the brown coal based fertilizers and biochar coated fertilizers. This work is financially supported by the National Centre for Research and Development of Poland under Grant No. BIOSTRATEG3/347464/5/NCBR/2017.